Today was another running and health first! Rob and I got body composition analysis done at our Alma Mater. We are trying to take our training to the next level and a part of that is getting some good data. First is body composition with a Bod Pod, then in a few weeks we will have a VO2 Max test, and the week after that a fuel metabolism test. Today’s body composition was to get our weight, body fat, and muscle mass. The Bod Pod does air displacement and pressure to get the measurements. We plan to do the body composition test again once we are at the peak of our next marathon training to see if there are any changes. The VO2 Max testing and the fuel metabolism will help us learn are aerobic capacity and our efficiency of burning fat vs. carbs. The Bod Pod test is easy and painless. It requires wearing just a shorts, sports bra (for me), and a swim cap (to keep hair up). They calibrate the Bod Pod by pressurizing it with nothing in it and then again with a known weight in the pod. Then they took my weight and it was my turn in the pod. I just had to sit there as relaxed as possible. There was just a minute of pressure change and then they do the same test a second time. That’s it! All done! 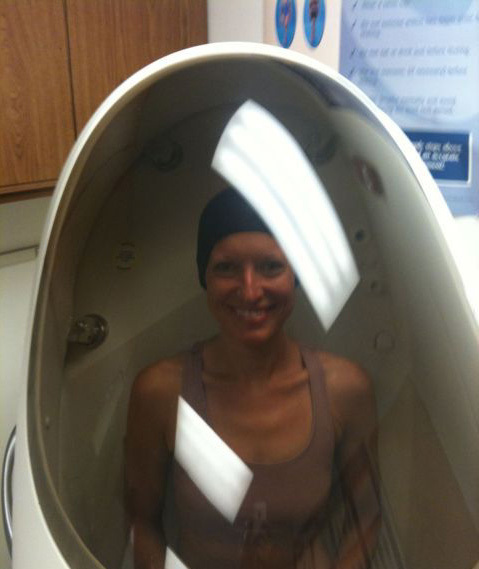 Me in the Bod Pod. The ladies who run the tests seemed really happy with my high fat free mass. 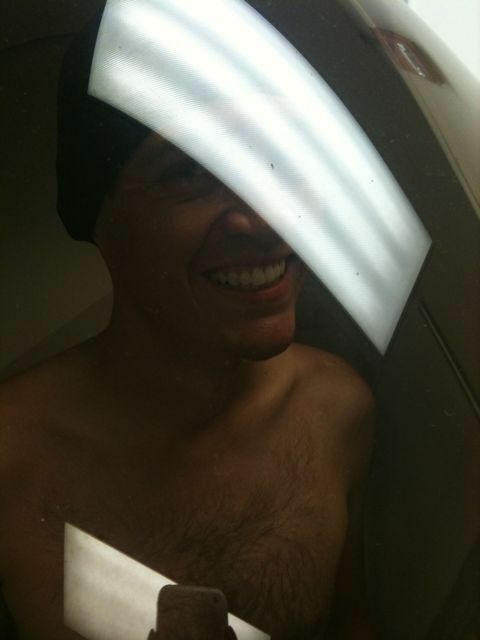 Rob in the Bod Pod. This evening I ran 5 Miles Recovery (Treadmill, 1.5% Incline, 39:29, 7.54 Pace) followed by 1 Set, 2 Mins, Plank and 1 Set, 45 Secs, Side Planks. How cool! I’d love to have that done. It would make the info in the book “Racing Weight” much easier to apply. Is that what you are following? I had the opportunity to get a free Vo2 Max test done a couple months ago. Also great data if your a numbers geek like me. It’ll really help you fine tune your training. Wowzers, you are totally in shape! Way to go on a great fitness report! That is so neat. You are also in such great shape. I would love to do something like that once I get back into running shape after rehabbing my knee. That’s so cool! I’d be terrified to know my specific numbers!